and our rabbitry name is registered to Aaron Webster as AA Rabbits. Our ARBA rabbitry number is D871. Within the next month I plan on becoming a member of the Texas Rabbit Breeders Association which is an ARBA affiliated rabbit club. 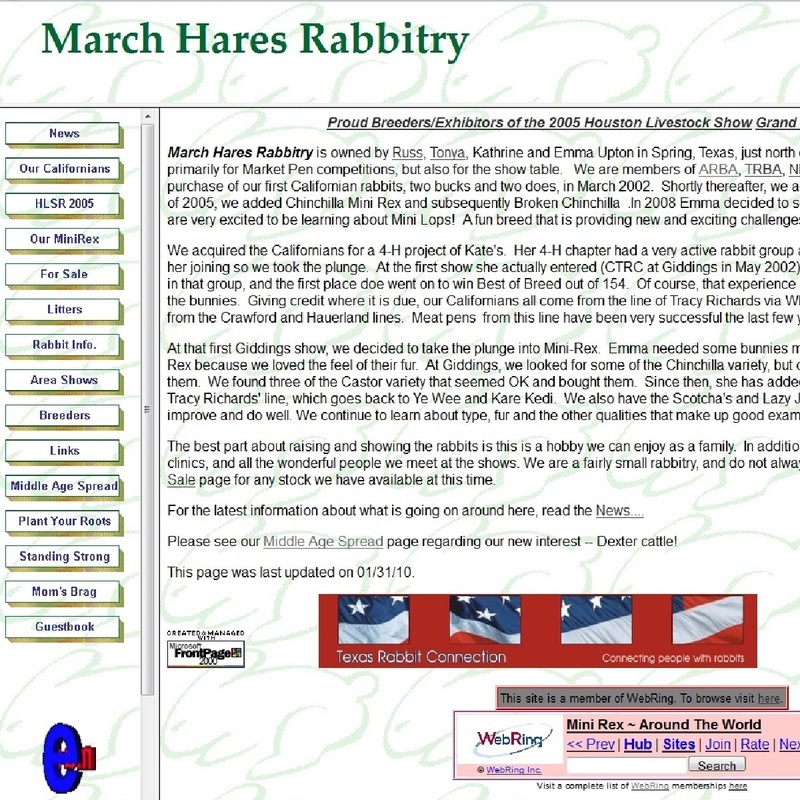 Rabbitry Description: March Hares Rabbitry is owned by a very nice family living in Spring, Texas. They have raised and shown rabbits for quite a few years and have had very good success at breed and meat pen shows. They currently raise Californian and Mini Rex rabbits, for more information you can visit their website. Rabbitry Description: Heaton Rabbitry is a large rabbitry located in Huntsville, Texas. They specialize in selling Meat Pen Bunnies to students and in my opinion they definitely have one of the best rabbitries in the industry. They sell both Californian and New Zealand Meat Pens. 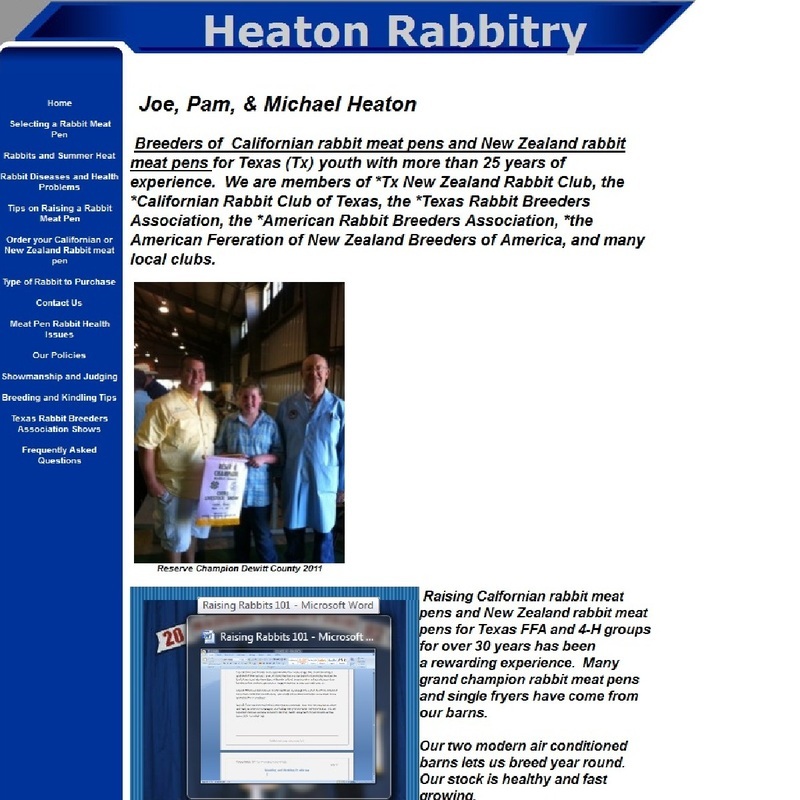 For more information about Heaton Rabbitry you can visit their website. Here is a list of informational resources on raising rabbits in texas. If you know of any other great services or articles send me an email and I will list them here. Since you've already made it this far... Here are a few Texas Rabbit Videos for you to enjoy. Have Fun Mate! Are you looking for information on Texas Rabbit Shows? If so check out our rabbit shows page.